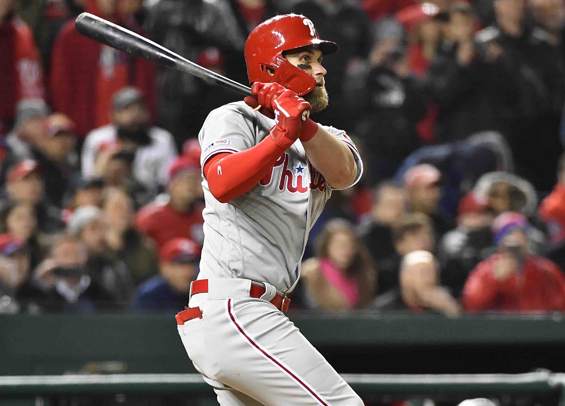 The Phillies have opened the season with four straight wins and are off to their best start since 1915, a year that saw the club win eight straight en route to the National League pennant. Last night the Phillies pieced together a solid performance, chasing Nats ace Max Scherzer out of the game after just five innings while Jean Segura hit a three-run double, Odubel Herrera collected three doubles, and Maikel Franco homered for the third time in four games. Oh yeah, Bryce Harper also homered, hitting an absolute bomb that landed in the second deck in right field. He then flipped his bat into the air for one of the more pronounced celebrations you'll likely see in all of baseball this season. Now, the Phillies turn to their ace in Aaron Nola to complete a two-game sweep and to open the season with five straight wins. Nola (1-0) picked up the win and allowed a run on two hits and a career-high five walks while striking out eight over six innings Thursday against Atlanta. “You’re not going to be dominating all the time, and you’re going to have games where you have to battle through innings and battle through hitters more times than not,” Nola said. “The second inning, I had to battle. I walked three in that inning, and they scattered a couple of hits. I’m going to run into those kinds of outings." The Nationals counter this afternoon with veteran Anibal Sanchez who will be making his first start of the season. The right-hander pieced together a solid season in Atlanta last year, posting a 2.83 ERA in 136 2/3 innings. Wednesday's lineup is identical to what manager Gabe Kapler has used in the previous four games. For some perspective, he never used the same lineup more than five times in all of 2018. Reliever Tommy Hunter was in Philadelphia on Tuesday to undergo an examination of his right forearm. He's dealing with a strained right flexor tendon and reported some discomfort following a bullpen session last Friday. Kapler had hoped to have him back with the club by mid-April, but not that doesn't appear likely.